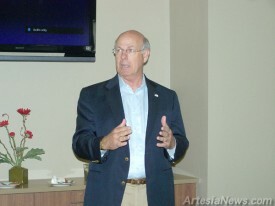 Former U.S. Representative Steve Pearce (pictured) is hitting the campaign trail with full force as he vies for re-election in New Mexico’s District 2. The Republican from Hobbs is hoping to regain the seat currently held by Democrat Harry Teague. A fundraiser and reception was held at Hotel Artesia Thursday, where Pearce spoke to attendees about issues such as immigration and health care. The reception to support Pearce was organized by a host committee which included Peyton and Linda Yates, Robert and Deb Chase, Johnny and Terry Gray, Lowell and Norberta Irby, Steve and Kathy Ripley, Mack and Marilyn Chase, Rep. Bill and LaNette Gray, George and Barbara Gandy, Gary and Sara Sims, Alan and Peggy Deans, Bill and Wanda Sweatt, Chuck Moran, Mike and Flo Williams, Doug and Terry Chandler, Eddie and Debbie Guy, Tim and Theresa Baize, Mike and Judy Deans, Kirk and Sherleen Irby, Ronnie and Kathy Wilbanks, Ray and Karen Westall, Johnny and Rose Mary Knorr, Cooper and Judy Henderson, Dennis and Betty Maupin, Frank and Robin Morgan, Joel and Karen Carson and Glen and Delia-Cortez Collier.